A representation of style and comfort at its best, the Cardin Swivel Stool will make any home feel welcoming and refined. The stool features an Oxidado finished metal frame making up the splayed legs, footrest, and angled arms. With cozy, upholstered seat and back, you'll be able to swivel from side to side and converse with your friends and family in comfort. 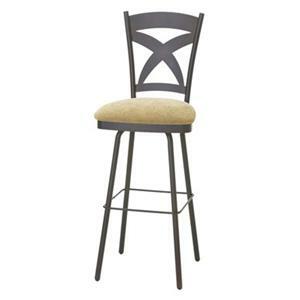 The Boudoir 30" Bar Height Cardin Swivel Stool by Amisco at Dinette Depot in the Brookfield, Danbury, Newington, Hartford, Connecticut area. Product availability may vary. Contact us for the most current availability on this product. The Boudoir collection is a great option if you are looking for Contemporary furniture in the Brookfield, Danbury, Newington, Hartford, Connecticut area. Browse other items in the Boudoir collection from Dinette Depot in the Brookfield, Danbury, Newington, Hartford, Connecticut area.